Lindsey Skylon Return To Southbank? These days, refer to Skylon on the Southbank and you're name checking the Royal Festival Hall's swish, new, panoramic outlook restaurant. 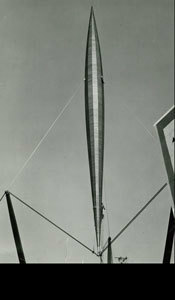 But, of course, it was named for the cigar shaped monument that once poked up here, as part of the Festival of Britain. Seems 1950s nostalgia's catching. Last week, English National Ballet presented Festival Ballet at RFH remembering their own Festival of Britain nascence. Now, there's a campaign to garner public opinion on whether to rebuild the iconic 300ft tower in time to light up the 60th anniversary of the post-war Festival. As part of the current Festival of Architecture, there's an exhibition starting on Wednesday at Jubilee Gardens to coax you all aboard and the campaign is backed by the Royal Academy and led by an ex-presdident of the Royal Institute of British Architects. That's power housing, in architecture terms. Nowadays, a 21st century Skylon would be eclipsed in height by the London Eye and other buildings so various locations are up for grabs apart from the original Southbank spot: Battersea Gardens, Battersea Power Station and City Hall as well as alternative cities, Edinburgh, Cambridge and Newcastle. But we don't want it going out there, do we? The public vote happens on Thursday 10 July. Set a reminder in your calendar and back this crazy Southbank building dream. Image from the gallery on the Re-Build the Skylon website.